32 pages of why not to learn the daf or go to the - סיום הש"ס a.k.a. Kanoyim have lots of time and plenty of money. They're pulling out all the stops, really stretching it here. Is this the last cry of the zealot? Is he desperate because he sees this as a contradiction to his lifestyle and to what he's been taught all his life? I would suggest that he take the hits with a smile and continue anyway, otherwise he's letting us all know that his belief system is hanging in the balance. It's not like he's trying to save all those people from doing something terrible; it's more like "!לך לרחוב יפו" don't do it here. But I do sympathize with the קנאי just a bit. It's a bit much already. Can you guess what? where? and why? Yeshiva World has a gallery of photos of the Australian Siyum haShas that took place today. Or was it tomorrow? I'm confused. Is it today in Australia now or tomorrow? so was this yesterday or today? In any case they had some guy named Danny Weiss take pictures for them and send them in, which they then posted on their site. It so happens that our man in Melbourne also sent me a picture of a Rov in Melbourne speaking at the same event. That Rov is a HaRav Reb Tzvi Telsner, dayan of the Lubavitcher Kehillah in Melbourne, and let me tell you, זיי האבען זיך נישט וואס צו שעמען from the other Kehillos there, שכבודם במקומם מונח. So after seeing that YWN had a gallery of their own I was curious to see if RZHT was also pictured there, or did I have an exclusive picture here? Lo and behold! The picture wasn't there. You figure that in small out-of-town places like Melbourne there would be some sort of achdus, but look at some of the faces here, the discomfort, the unease when Rabbi Telsner speaks; poor guys... SO why is it that davka his picture didn't make it to the official gallery? 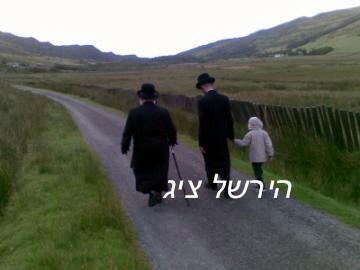 Was it the photographer who never bothered with Rabbi Telsner? did he take it and not send it in? did he send it in and it was rejected by YWN? Here's what I have so far. There are more, I just can't post them all. Smaller pictures can be clicked on. I bring a page from Rakeffet's book as well, since one of you asked for "proof." I believe it was Elchonon. Not all of the letters are proof, but they're very nice to see in any case. There's a whole lot of politics going on in Bnei Brak that truthfully none of us should know about. It's as dirty as any machlokes that ever happened in our circles, and even more so. I am nauseated by it, simply put. I cannot bring myuself to read the reports, to listen to the incriminating recordings or to read the pashkevillen from either side. It's bad because that Oylam is not really used to this kind of behavior, or at least it's never happened like this before. Yes, there were small inter-Yeshiva politics like in Ponovizh or Grodno-Ashdod, but certain things were totally off limits. 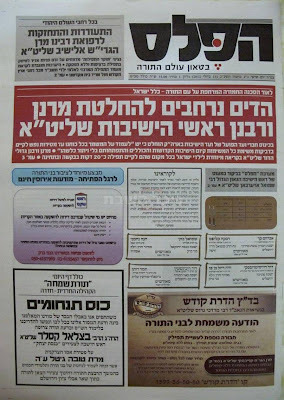 You didn't speak out against the Z' kan HaRosh Yeshivos, something that we see now is happening by those who oppose Reb Aron Leib's opinion regarding the newspaper. He's too liberal for them, he doesn't hate Chabad or the Chilonim so he must NOT be the leader. 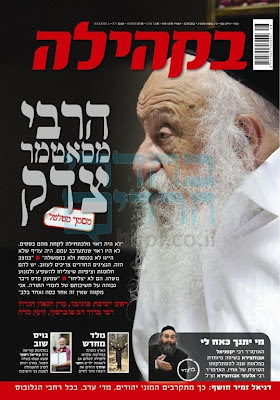 It used to be that pashkevillen were thrown against others like Chabad, but now they're doing it to their own Gedolim, people who even Chassidim have the greatest respect for, like Reb Aron Leib. No, I won't post them here. Basically how the "Daas Torah" sausage was made all these years is now coming to the surface with the two Yeshivishe newspapers having out for all to see. 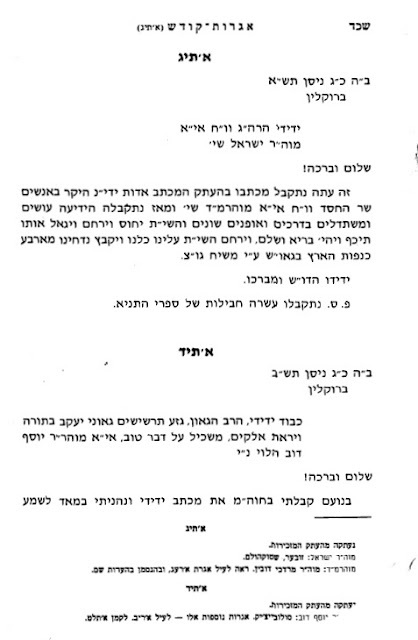 Most of the Oylam is behind the old guard of Reb Aron Leib Shteinman and Reb Chaim Kanievski and they support the changes that took place at the Yated. But many hard liners stand firmly behind Rav Shmuel Auerbach, who they say is the TRUE mamshich of the late Ponovizher Rosh Yeshiva, deceased now 10+ years. 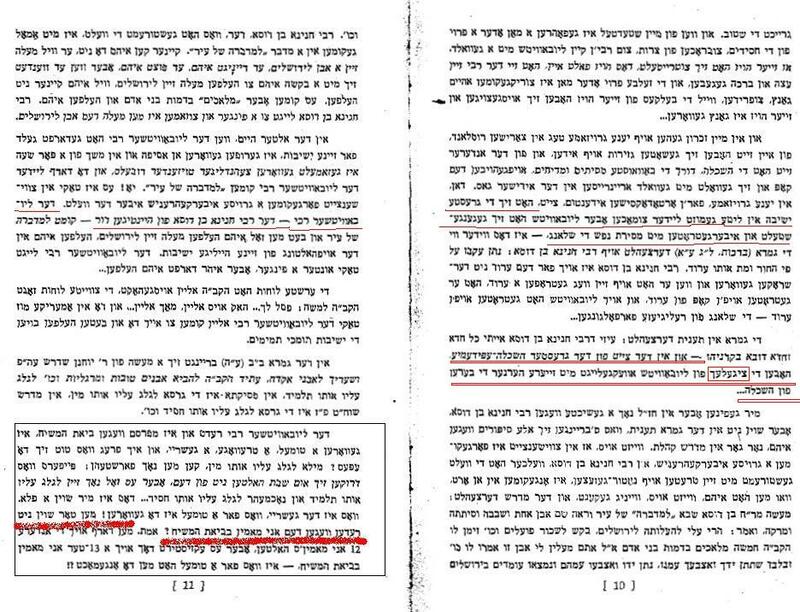 (while Rav Elyashiv zt"l was alive and well they respected him, despite the fact that he wasn't on the same page with the PRY, and they didn't dare fight like THIS, although there were plenty of smaller fights in his lifetime, never you mind.) 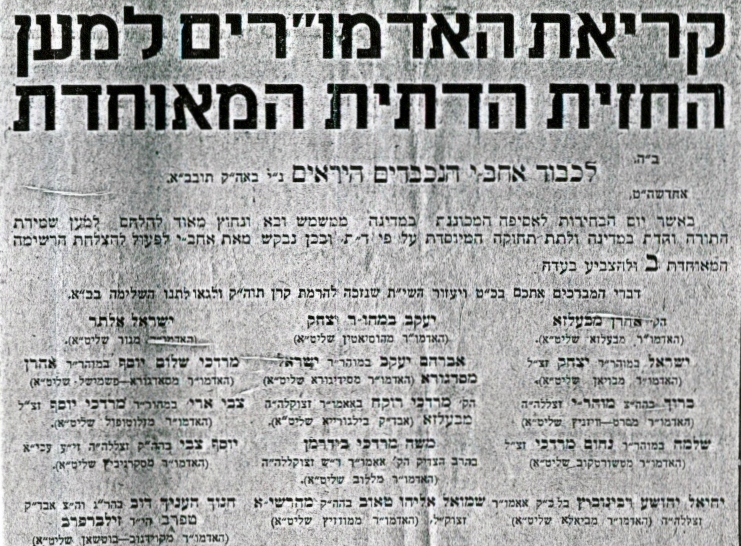 They started their own newspaper, named הפלס (HaPeles, the level) which is loyal to Auerbach. Please don't take this the wrong way, but Reb Shmuel needs to smile more! That פארכמארעטע פנים is too much. 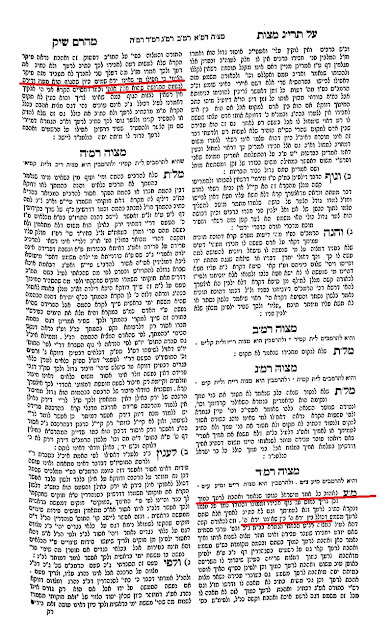 We Lubavitchers,as usual,like to think that degel haTorah was founded only because of Lubavitch, that everything else was OK between the two factions in the Israeli Agudah, and that the יתד נאמן was founded ONLY to attack Lubavitch, something that the Israeli המודיע would not allow to happen. Of course you'll accuse us of thinking that the world revolves around us, but there's plenty of truth to it. Well, here's the story as it happened, with all the somewhat juicy details. Source unknown. Take it or leave it. לצערינו הפילוג מאגו"י וכן הקמת עיתון מתחרה להמודיע אכן קם והיה בסופו של דבר על רקע החרמת עדה קדושה. (אם כי יתכן שהיה זה הקש ששבר את גב הגמל, וקדמו לארוע מאבקי כח קודמים), ומעשה שהיה כך היה, ארגון אגודת חסידי חב"ד ביקש כהרגלו מימים ימימה לקראת ערב חג הפסח הכניס לעיתון המודיע בגליון החג מודעה בתשלום המכילה איגרת קודש מכ"ק האדמו"ר מלובביץ'. בימים ההם היה איזון מקובע בעיתון בין עורך מייצג לחסידים ועורך מייצג לליטאים, הרב שך גילה ענין רב בעיתון והיתה לו השפעה רבה בעריכה הוא נהג לבקש עדכונים שוטפים מכל פרט, לקראת ההו"ל איש אמונו העורך ישראל שפיגל עדכן את הרב שך בפרט זה בן שאר הפרטים השוטפים לאותו גליון כתגובה קיבל הוראה נחרצת למנוע את הדפסת המודעה. העורך עמית משה עקיבה דרוק שייצג את הצד החסידי בעיתון עדכן את האדמו"רים מגור ו-ויזניץ שהורו לו נחרצות להכניס את המודעה בכל מחיר שכן "צינזור מכתב תורני מגדול בישראל יש בכך משום דין בזיון ת"ח" כדברי הרבי מוויזניץ זצ"ל. אך הרב שך עמד על דעתו והעלה את הנושא בהתבטאויות קשות בישיבת מועצגה"ת שהתקיימה בי"ב ניסן, יום לפני ירידת העיתון לדפוס. ראש ישיבת טשעבין הג"ר ברוך שמעון שניאורסאהן זצ"ל וראש ישיבת רוזי'ן הגר"פ בערנשטיין (צ"ל רבינוביץ'?) כמו גם גאב"ד ערלוי שליט"א ניסו להתווכח עימו וזכו לקיתונות רותחין, לידיעתך לדברי מזכיר מועצגדה"ת ר' אבישי שטוקהמר, הרבי מגור זצ"ל רק זימזם רוב הישיבה וכלל לא דיבר, רק כשהרב שך סיים דבריו הציע האדמו"ר מסלונים זצ"ל להעלות את הנושא להצבעה, התוצאה היתה שהרב שך נשאר בודד בדעתו בענין זה. האי נעימות היתה גדולה, או אז הרב שך איים שאם המכתב יודפס אין לו יותר מקום במסגרת זו. אחרי שקט ומבוכה שהשתררה אמר הרבי מגור רק 6 מילים "די תורה וועט שטיין אין צייטונג" = "האגרת התורנית תודפס בעיתון". אכן המודעה הודפסה, בעזרת גולדקנופף דרוק גבר על שפיגל, הסיפור דלף והיה לשיחת היום בימי הפסח. בהמשך הרב שך הרגיש פגוע פרש מהמועצה והניע את בעל הקה"י לפתוח את יתד נאמן ומכאן הכותרת לפילוג "החרמת עדה קדושה" כי אכן זה היה הנושא שגרם לפילוג, אנשים לא טיפשים וגור לא מכרו לוקשען לאף אחד, דווקא באסיפה ההיא עיקר הזעם על כוונת ההחרמה באה מכיוונו של האדמו"ר מוויזניץ, עכ"פ בחדר נוכחו יותר מדי אנשים שסיפרו על כך. הרב אבישי שטוקהאמר מזכיר מועצת גדולי התורה עורך הפרוטוקול מהאסיפה ההיא חי וקיים עימנו, באם לדעתך התאור לא מדוייק הוא הכתובת. זו האמת ההיסטורית הידועה לבני הדור ההוא. 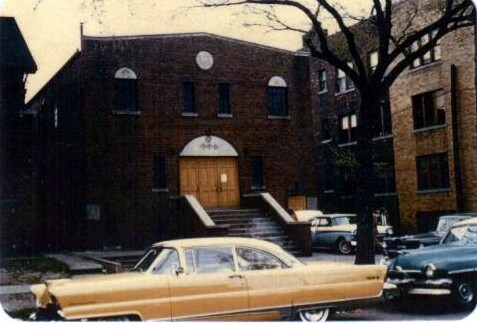 The Detroit Stoliner shul, Beis Aron V'Yisroel when it still was a shul. 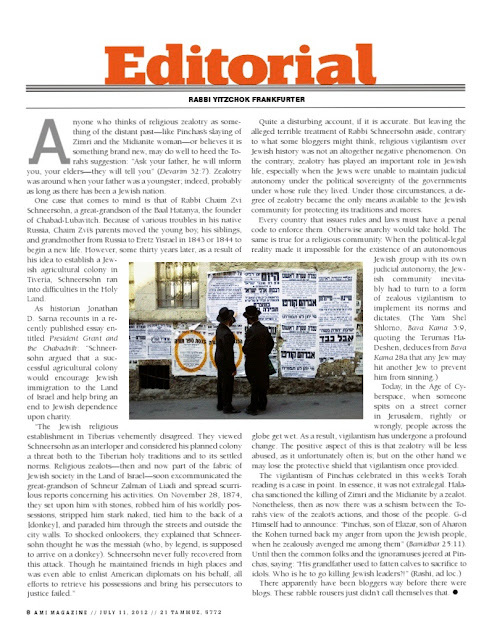 First a bit about Stoliner chassidim in Detroit. 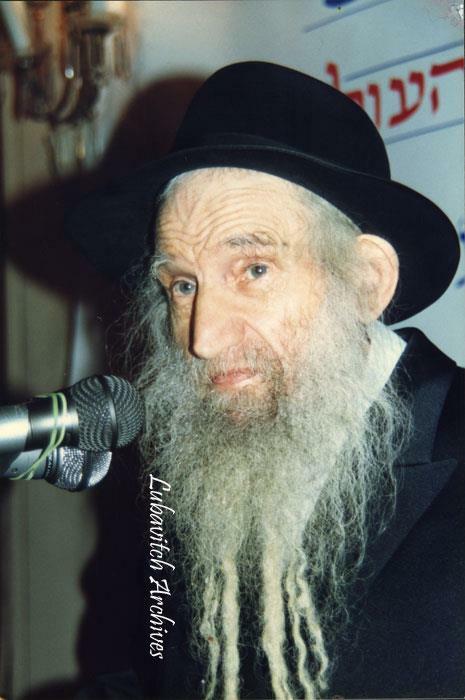 The Rebbe Reb Yisroel Perlow ZY”A, known as the Yenuka, started sending chassidim to the US as early as 1880. Detroit was favored over other areas because it was easier to get jobs that did not require one to work on Shabbos. Stoliners organized a minyan/shul as early as 1905 in Detroit and one of the Rabbonim who served as Rov in their shul was Rabbi Yitzchak (Isaac) Stollman z”l. 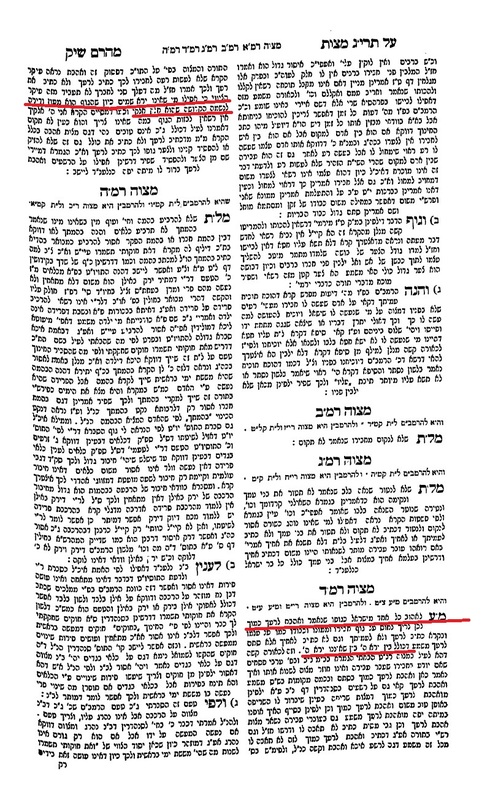 Reb Mendel Zeilingold (a Stoliner from Lutzk, who later lived in New York and then Yerushalayim) said over that the Yenuka once said; ווען מיר וואלטען געווען מיט צעהן יאהר יונגער וואלטין מיר געמאכט א נסיעה קיין דיטרויט". They say that at the turn of the century there were around 100 Stoliner chassidim in Detroit. 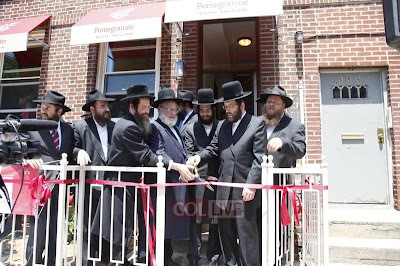 The shul that you wrote about in the 2006 post was built by the chassidim themselves. Mr. Tzvi Strom is an einikel of Mrs. Chava Wainer, in whose house the “Detroiter” Rebbe was niftar. 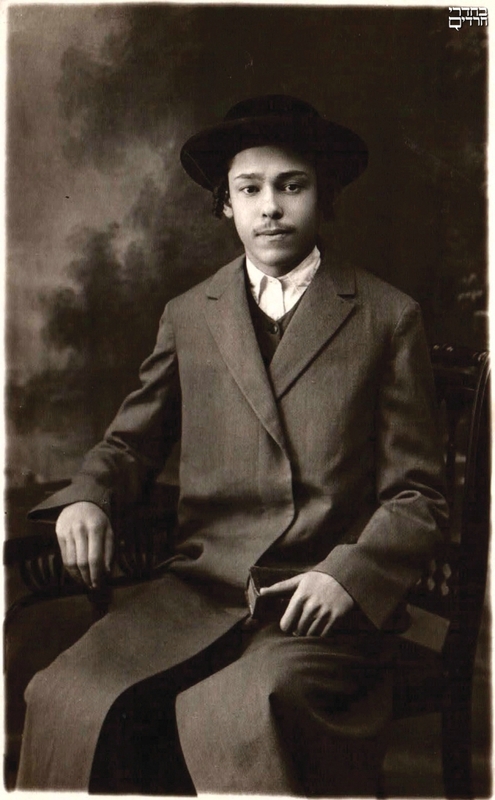 He remembers pounding nails into the floor boards on his way home after school in the ‘30s. That neighborhood in Detroit started going downhill in the 50’s. The decline was swift. 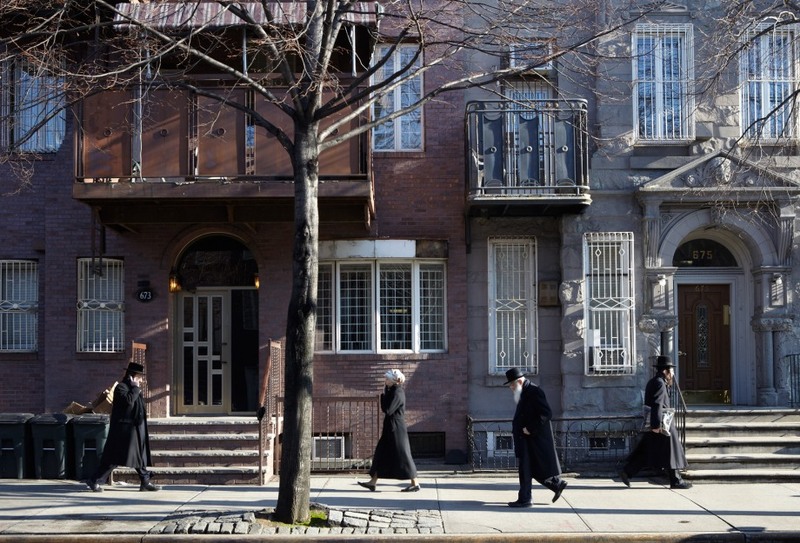 Many of the older chassidim had died out and the younger crowd joined Young Israel etc. 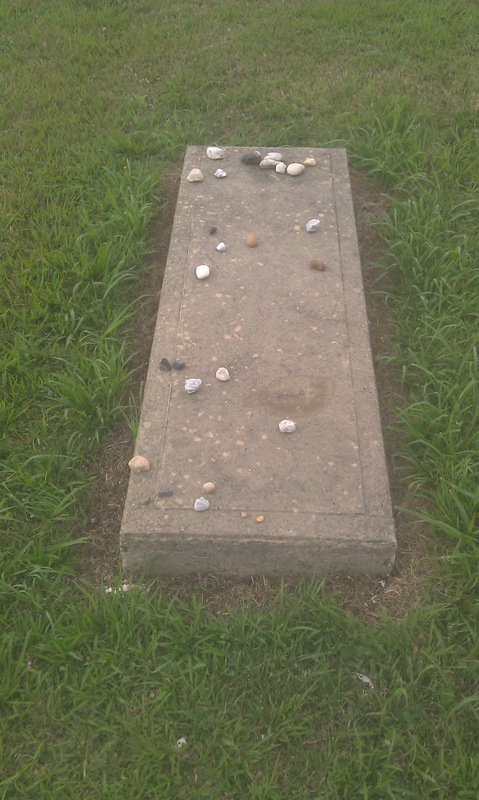 Few were left to care for the shul and the “chelka”, the cemetery area where the Rebbe is buried. 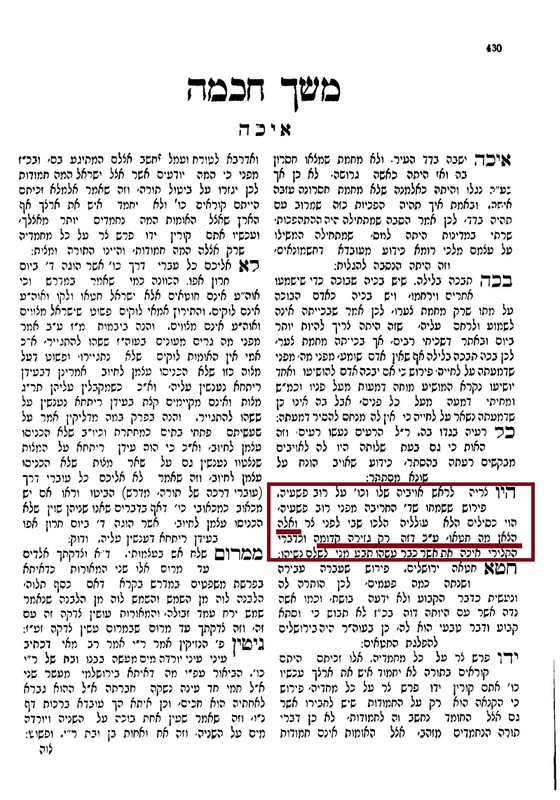 Some say that the previous Rebbe, Reb Yochanan “shtelled avek" one memuneh to make sure that the shul would not be sold, or one version is, that it should not be sold to a church. That story goes on to say that this man worked all the time to ensure this, He put clauses into the shul documents etc. But he was once hospitalized for a short period of time and came out to find out that it was too late. I also heard from an older chossid that the Stoliners would come every year and work on eitzos to keep the shul up and running. 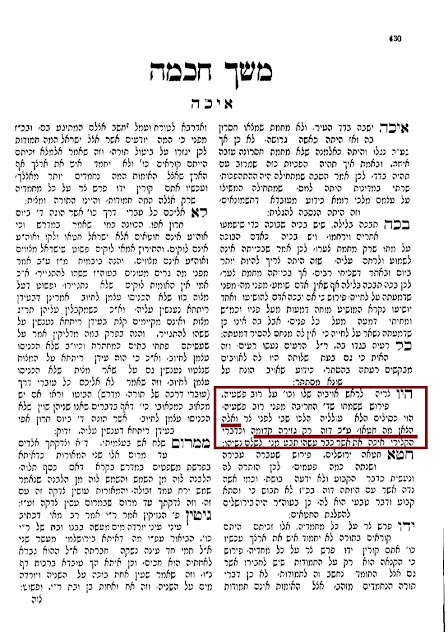 He said that there was a law at the time that a store within 2 blocks of a church, (not a shul) could not sell liquor. So there was one store 1 block away and another 2 and ½ blocks away. The chevreh went to the farther store and told him that the synagogue is costing a lot to maintain and it might end up being a church (which is what happened to many other shuls in the area), and that would result in the other, closer store being allowed to sell liquor and him needing to shut his store. The proprietor got very nervous and asked what he can do to help? The chassidim told him that if he helps pay for the maintenance of the shul then they won't need to sell it. The guy helped them out financially for a few years. Sadly, later on the Yeshiva in Boro Park received a phone call from the Detroiters that they are sending a large amount of cash for the Yeshiva. They immediately understood what happened, and they dispatched 2 or 3 people to Detroit and tried to “handel” with the buyer. They even offered him twice the amount that he had paid for it but to no avail. The buyer, though, was some sort of Boy Scout organization or something similar. It was not sold directly to a church. Brokenhearted the chassidim returned to New York. 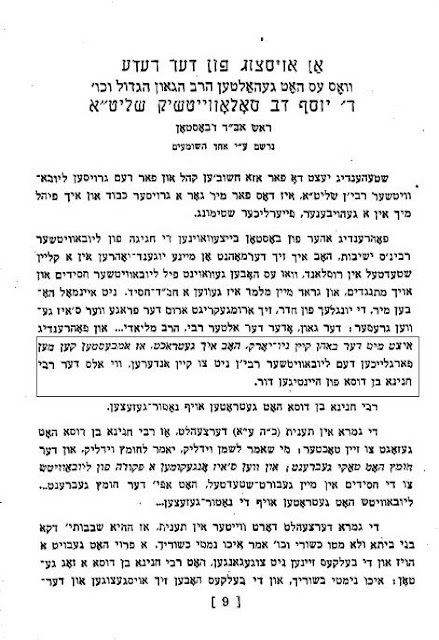 Either way, to say that the Stoliners SOLD the shul, and to a church nuch dertzu, is a fabrication. Research is currently being conducted to try and find out more about the chassidim of that era, in Detroit and other areas across the USA. Anybody with information is asked to email stoliners.usa@gmail.com. דאס אידישע שפראך האט נאך א כח, זעהט אויס. און ערד ארבעט אויך! צו איר זענט א אידישיסט צו נישט, דארפט איר דאס מודה זיין. נישט אז אידיש אליין איז א "זאך" פאר זיך, שוין, אפשר יא, וואס זאג איך? אוודאי יא! אבער עס ציהט מענטשן צוריק צו תורה און מצוות. מענטשן זעהן איין אז דאס שפראך איז געקניפט און געבונדען צו תורה און מצוות, און אז מ'האט ליב דעם שפראך קומט מען נענטער צו א אידישען לעבנסשטייגער. פונקט קאפויער פון ווי ס'איז אמאל געווען. אמאל אז מ'האט "ליב געהאט" אידישע שפראך און ביכער האט עס געמיינט אז מ'איז אנטי-דת. אבער אויך דאס אז אידיש ציהט צוריק צו תורה איז נישט ביי אלע שיכטען און קרייזען. ביי די חרדי'שע אידן וואס אידיש איז ביי זיי נאך דאס מאמע לשון זעהט מען ווי זיך אריינטוהן אין אידיש קען מעביר על הדת זיין. יונגע מענטשן וועלכע האבען שוועריקייטן מיט ענגליש טרעפן א נייער אויסוועג אין אלטע אידישע ביכער וועלכע זענען לאו דוקא ע"פ רוח ישראל סבא. זיי באסמאקעווען זיך אין די אלטע שרייבער און ווערן צוביסלעך אוועק געצויגן פון א לעבן פון תורה און מצוות. אבער דא רעדט מען נישט פון די סארט אידן. דא רעדט מען פון אידן וואס ווי ס'זעהט אויס קומען פון נישט חרדי'שע הונטערגרונדען און וויילען א פאר טעג צו וואכען אויף א אידישע פארם וועט נאר צוגעבן. 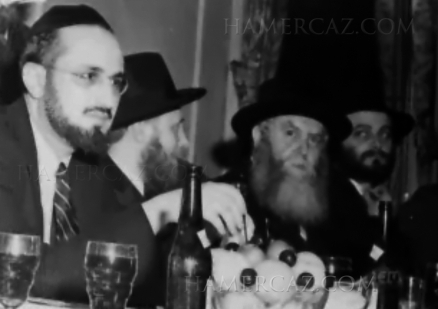 At the dinner for the Central Lubavitcher Yeshiva Tomchei Tmimim in New York, 5702/1942: (l-r:) Rav Yosef Dov Soloveitchik, Rabbi Shmaryahu Gurary The Rebbe Rayatz, נ"ע, The Rebbe זי"ע. 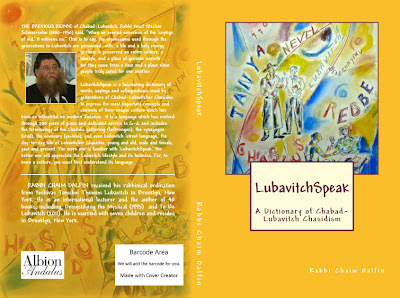 The following three pages are his speech transcribed as it was said - in Yiddish. 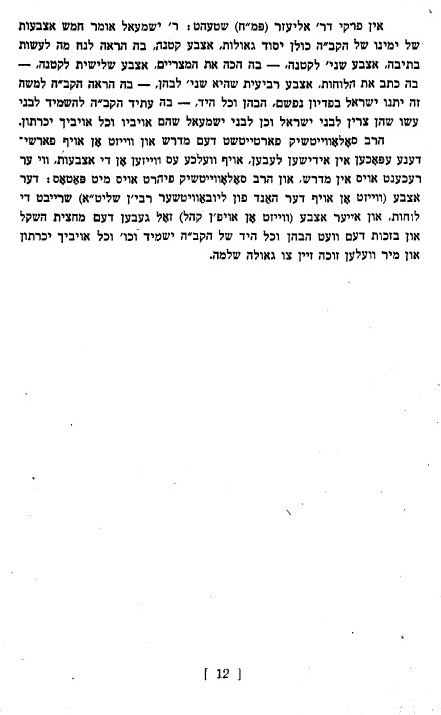 The Rebbe Rayatz was - you might say - an even bigger "fan" of the "Rav" than even the Rebbe was, and he pushed hard for RYDS to succeed his father Reb Moshe ben הגר"ח in RIETS. פארגעסט נישט אז אין אמעריקע האט איר א רעכט צו טוהן וואס איר ווילט ביי אייך אין שטוב אדער אין געשעפט און די אויסווארפען קענען גיין ערגעץ אנדערש איינקויפען טאמער ס'געפעלט זיי נישט. וויפיל מ'וועט זיי נאר געבן צו פארשטיין וועגן אונזער "קולטור" וועלן זיי זיך מאכען ווי תמ'עוואטע. די שנאה וואס זיי האבען צו פרומע מענטשן בכלל און פרומע אידן בפרט איז זיי מעביר על הדעת און זיי זעהן נישט ווי נאריש און זינלאז זייערע טענות זענען. נאר זיי האבען רעכט צו זיין פראנק און פריי אויף די אמעריקאנער שטייגער, אבער חלילה אז אן אנדערע זאל זיי שטיין אין וועג און אויך מאנען די זעלבע רעכטן! זייט נישט דערשראקען, מיינע גוטע ברידער, נישט פון זיי און נישט פון די פרעסע. די אמעריקאנע געזעץ און קאנסטיטוציע פארזיכערט דאס אז אייער לעבנסשטייגער איז אויך גאראנטירט, און אז קיינער קען אייך נישט צוואונגען זיך צו בייטען, נאר אז זיי זאל זיין באקוועמער קויפנדיג ביי אייך אין געשעפט. דער עם הנבחר האט מיטגעמאכט גרעסערע און שטארקערע נסיונות ווי ר' שלום דיען און זיינע "היפסטערס", און וועט דאס אויך איבערקומען. 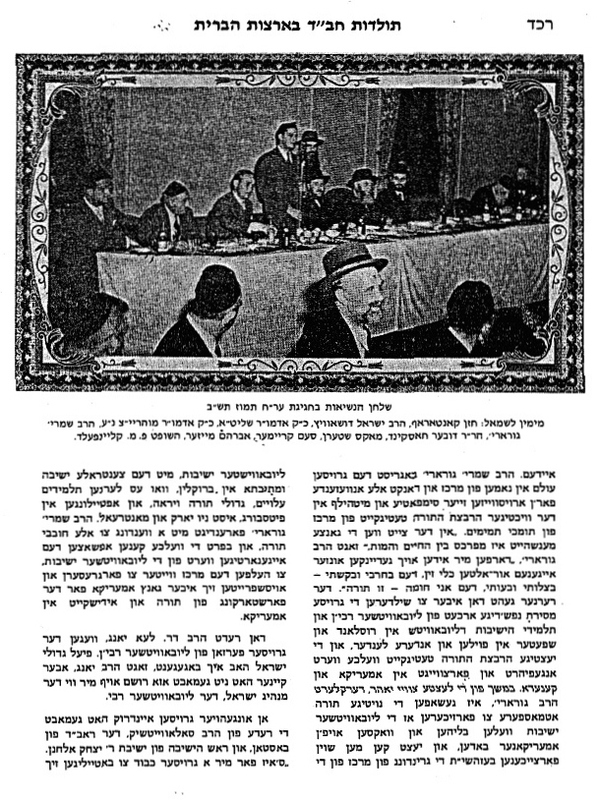 Yes, I too can see that there are 4 degrees of separation between the Rav and Reb Moshe Feinstein, and I'm tickled by the fact that the organizers seated them as such, but still, it's at the same table, בבחינת שלשה שאכלו על שלחן אחד. 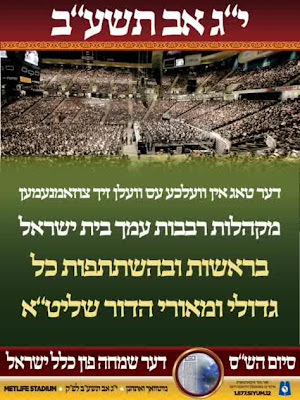 You would think that the siyum haShas could be the same way, that we can put our differences aside for one night, and for most people it is that way. I just wish it could be that way for All of us. when all else fails - post pictures! Between work, sending kids off to camp, trying on shirts before the nine days and my usual hectic schedule of Torah and Avodah, there has been little time for long blog posts. So we do what we can to keep you entertained and informed. 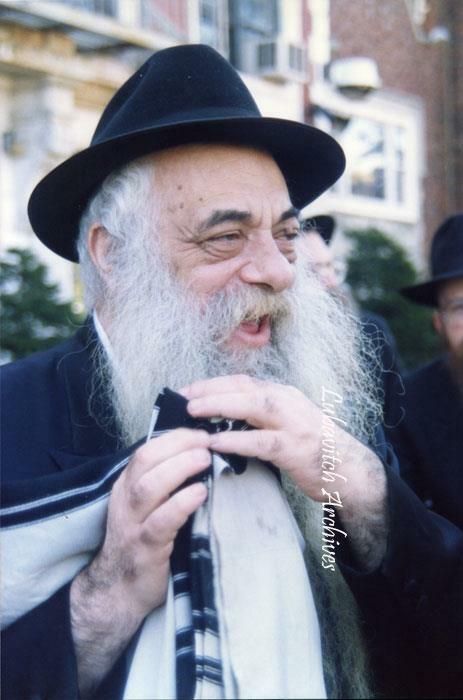 Enjoy these treasures, pictures of Reb Yoel Kahan at 770 on Chol HaMoed Sukkos, courtesy of Chabad Lubavitch Archives. What we're working on at Blog HQ. Another drawing by the same artist from the same book as the one you see now up on top. I'd like to your very learned opinions on this one. Do we change it or leave it as is? I myself like the new picture but prefer the old text over the new one, most of it, anyway. I like how the new design has "הירשל ציג" in big and fancy lettering. The problem is that the talented designer is doing the design pro-Bono, so I feel bad to ask him to make changes. If any of y'all want to help the cause and spend a few minutes designing the header, I'd be much obliged to you. Thank You. 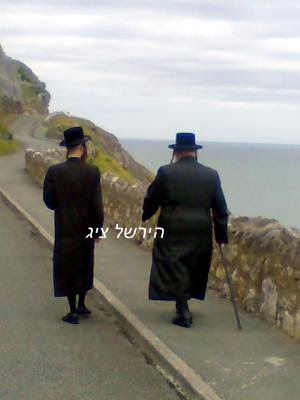 Yair Hoffman calls it "the end of an era"
A reader writes: "I don't know if this interests you at all but maybe you want to write about the Vizhnitzer Rebbe's vacationing in Llandudno (pronounced Chlandudno) and a bit of history of how Frum Yidden ended up going there. Llandudno has a lot going for it, The great Orme, a beach on each side and many attractions for families with children. It all started when the Jewish community started dwindling and the United Synagogue Shul there had to ask Rabbi Jaffe for help with a Minyan for the Yomim Noroim. (Rabbi Jaffe's Father In-Law Sydney Beenstock had a house and boat there, that's the Shaychus of the community to the Jaffes) So for quite a number of years The Bochurim of Yeshivas Lubavitch Manchester arranged a Minyan there. Rabbi Avremi Kievman, Rabbi Jaffe's Son In-Law and a Shliach in Liverpool used to come for Yom Kippur. The Rosh Hayeshiva (Rabbi Akiva Cohen) went for a year or two for Rosh Hashonoh. Anyway, the community was slowly slipping away, but Mr. Lee, the president wouldn't let go of the Shul. So instead of selling it he gave it to the Jaffes to rent out the apartments above the Shul to Yiddishe families for summer holidays etc. to keep the Shul going and now they have a minyan many times throughout the year where the Lees and another one or two Jews can join. There is also a "self-hating" Jew who has written anti religious articles in the Jewish Telegraph who lives near the Shul but never attends. 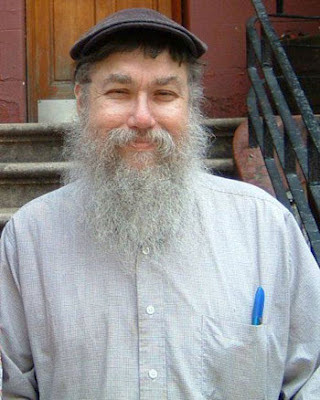 [Hirshe] Dovid Katz a professor at Vilna University stays nearby and used to join the Minyan Yomim Noroim and enjoyed conversing with the Bochurim in Yiddish. 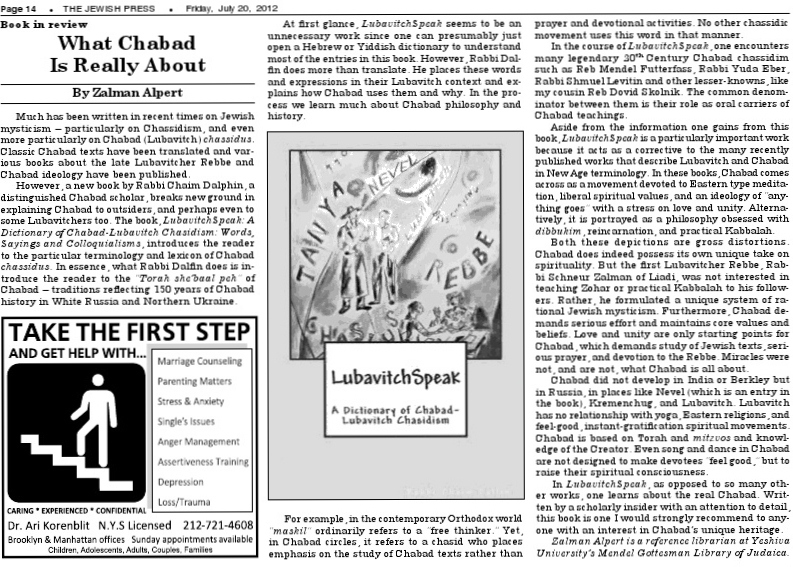 So anyway, once the Jaffes got hold of the building they called it "Chabad Retreat Center" and many families from Manchester and London use it out and many more stay at hotels, B&Bs or rent houses nearby during the summer. The Horodenker Rebbe, Reb YA Weiss of Manchester bought himself a house and Mikvah on the ocean and started going up there for breaks and shlepping his own Minyan along. I think he bought a second house for the extras. Then he bought a building for a mother and baby home like Beis Brucha in London except he doesn't make you pay for it and its near the ocean so it became very popular and many Ying Vaibelach from all over England spend time regaining their Koiches there. Enter Yanky Adler, Reb Yisroel Hager's biggest Gvir. He also buys a house on the ocean for his Rebbe's son to come and vacation there. RY has been going there for a month or two for quite a number of years now and Yanky bought a second house and built a Mikvah too. The big question was, now that RYH took over his father's throne would he still make time for Llandudno? Well, he's feering Tish there tonight! (Friday night) Yanky bought an old hotel with 40 bedrooms where RY is staying for Shabbos. I think he's in Llandudno for 4-6 weeks. Last week (בלק) was a private Shabbos. 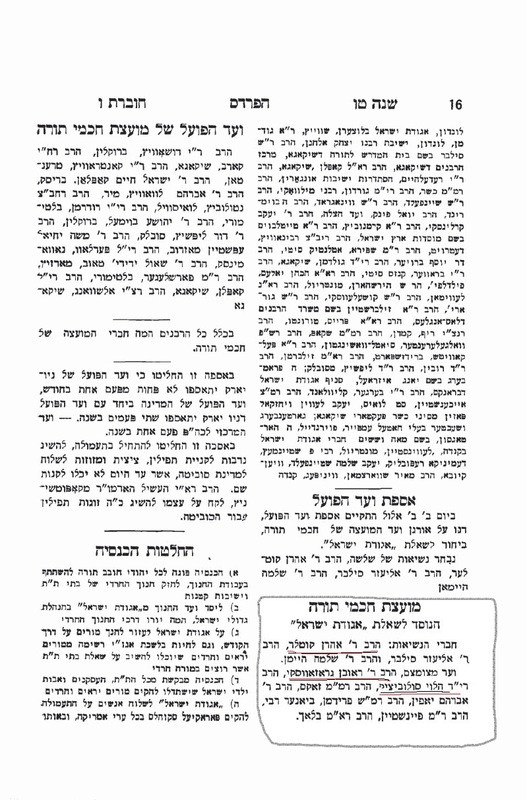 This week (פנחס) there are two Sholom Zochors and Brissen there. RY calls Llandudno "Lecho Dodi" because in Welsh it means "Queen of the Welsh resorts"." 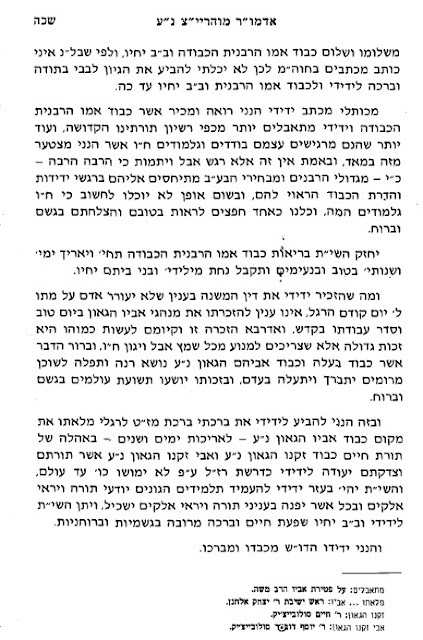 I'm sure R' Berel means well, but to compare the Kanoyishe mosdos to the the Litvishe is silliness. For several reasons, both financial and practical. For one, all the Kanoyishe mosdos combined don't equal what they have in Bene Beraq alone, meaning that there's no way in the world that tens of thousands of children, bochurim and yungeleit can be supported from a 'Keren Hatzoloh' like organization. Not to mention the girls schools and seminaries. Sorry. As it is the shnorr is non-stop, imagine if that increases ten or twenty fold. Banish the thought! How much can American Jews already be expected to give? Then there's a more practical issue; The good L-rd blessed the Satmar and its satellites with more gevirim per capita than any other group. And if not the most gevirim then for sure gevirim that are willing to part with large sums of money. G-d bless them, they give. 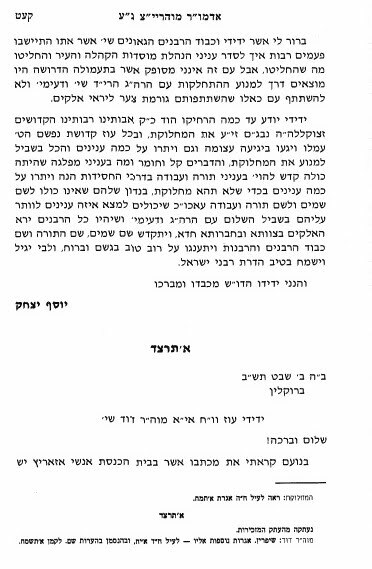 There's no way in heck that the Litvishe gevirim - whoever they are - will support all those Yeshivos, schools and kollelim that now decided to also only be on the take from individual donors, not from the "Treifene Medineh." They simply don't have the השגות that the אונגארישער געבער has. Maybe the Hungarian has a more guilty conscience and feels more compelled to give, whatever the case is, they give. And if no Litvishe go to work then there are no rich people, they'll have to rely on the Hungarians, who are up to their eyes with their own mosdos. Unless they go after the non-religious donors, which is difficult to do with the attitude that they have about frei people. 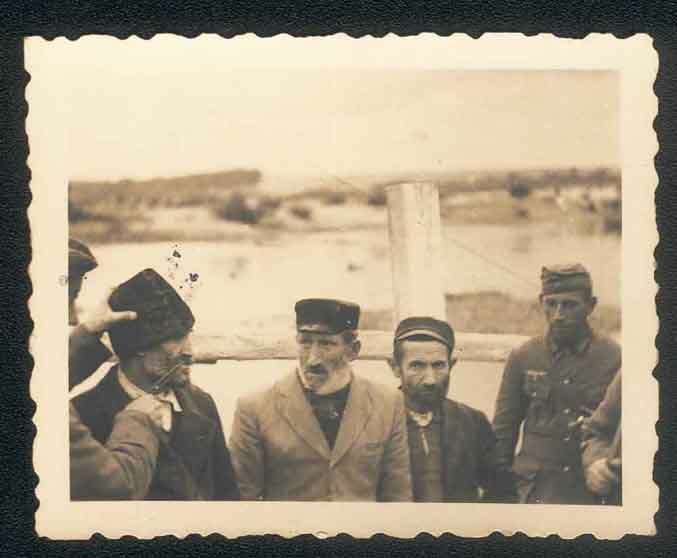 So why do we say that Reb Berel סר מן הדרך? Very simple. All the Gedolei Yisroel from the Brisker Rov to the Chazon Ish to Reb Isser Zalman to the Ponovizher Rov and Rosh Yeshiva - to you name it, they all said we should take money, so how can Reb Berel doubt them all? And yes, I put the Brisker Rov on the list because we all know that he allowed them to get Gov't funding, even if he didn't take any himself. Only if he leaves the path. (They may have put limitations on how much funding to take, but it was still a good chunk of change.) 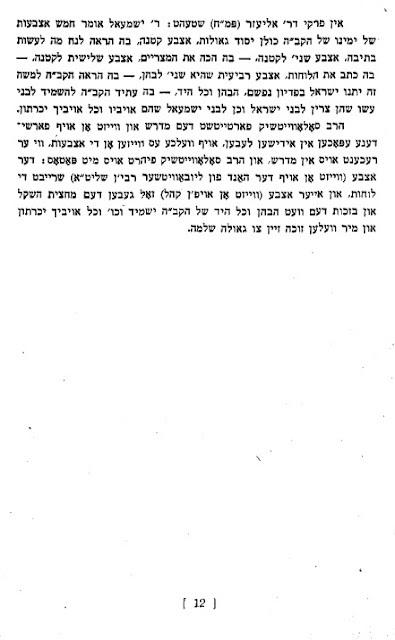 Which may be Why Reb Berel met Reb Yoel Kahan some 21/2 years ago. He's not with the Olam HaTorah anymore. He's some kind of new Satmar-Litvishe-Brisk hybrid that decides for himself to be Litvish but Kanoyish. Otherwise he seriously doubts whether or not the had the Daas Teyreh or at least the "veite kook" that the Satmar Rov seems to have had now. But if you ask me he'll probably regret ever giving this interview, once he sees what this causes. That's beside for the fact that it just looks bad that they only reason they'll wean themselves off the funding from State is because they ask for something in return - which is not even REALLY the case. For over 60 years, as long as they were exempt from Army service the money was good, now all of a sudden it's no good anymore? Did we miss something here? a new קבלת התורה perhaps? This law would come into effect even if the institutions took no Government funding. The way people in Israel see it it's about doing your share, whether or not you're supported by the ממשלה. Rich kids also go to the army. 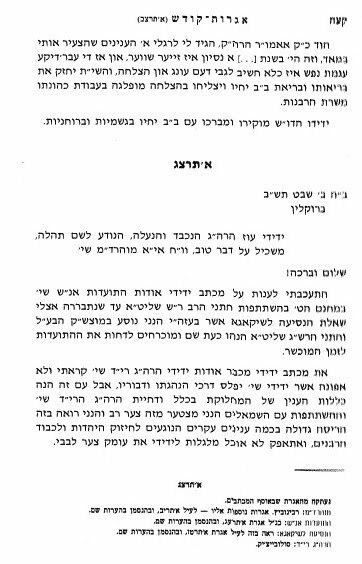 I doubt Reb Berel is saying that they should cease taking ANY money, even for individuals, like ביטוח לאומי, קופת חולים, or other stipends that families get per child. Because then he'd be condoning mass starvation... So what would not taking money for מוסדות accomplish, very little if anything. Maybe it would make them look even worse in the eyes of the irreligious. But maybe we shouldn't care since the Charedim will soon be the majority in the Medineh anyway... 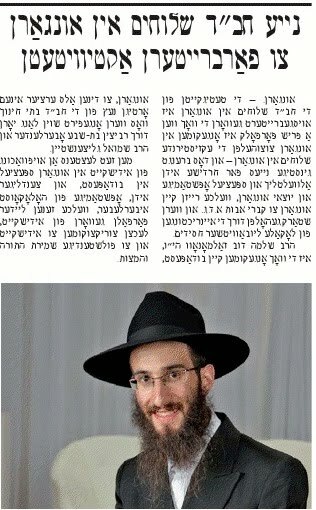 So the bombastic headline, made to make Satmar look good, perhaps? or everybody else look not so smart? It's nonsense. As far as what will eventually happen in ארץ ישראל? Time will tell. We'll talk about that soon, אי"ה. Read the whole first issue on Scribd, or on Box.com if your filter blocks scribd. See how the sausage is made here. Read the editorial and tell me what you think. And they say that Rabbi Frankfurter is a "משכיל." Fooey. Why does he play into their hands? There are better and more "enlightened" (sorry) ways to make the same point! Does he not know that a public figure like himself can't go around condoning violence like that, no matter the precedent and no matter what the ים של שלמה says. Some things are best left unsaid unprinted in a public forum. Even I know that and I don't have editors and censors and advisers to remind me of that. Hey! Does he mean me when he attacks those "bloggers/rabblerousers?" You take that back right now, Rabbi Frankfurter! בראשית השליח המסור הרה"ת ר' דוב שי' מאנדעל האט היינט זוכה געווען צו א באזוך פון דער סאטמאר רבי שליט"א פון קרית יואל יע"א, ווועלכע איז - זעהט אויס - געווען אין פ"וו וואו עס געפינט זיך א גרויסארטיגע בית השחיטה פון סאטמארע בהמות און עופות נאכצוקוקען ווי אזוי עס ווערט געפירט די שחיטה דארט. די מקוה איז נתנדב געווארען דורך חסידי סאטמאר פון קרית יואל וועלכע געפינען זיך אפט דארט צוליב האנדל און געשעפטן. Reb Avrum Banda (c) posing with Rabbis Berel (l) and Gedalia (r) Shemtov in Crown Heights today, where he and family inaugurated the new Pomegranate Shluchim Suites. 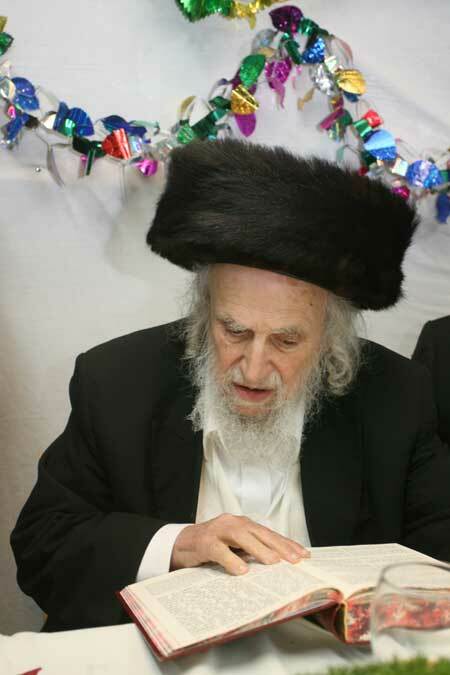 Gedalia founded - together with his uncle Reb Mendel Shemtov, ע"ה, - and runs the Shluchim Office - a resource and assistance center for Shluchim - in Crown Heights, and his father Reb Berel is the Shliach to the State of Michigan, and has been since 1958. He is the son of Reb Bentche Shemtov whom we discussed in yesterday's post, and a somewhat controversial figure in Lubavitch due to his very unique style of doing mostly everything. That being said we're very proud of the fact that Reb Avrum, a Satmarer Yid, donated this beautiful facility in honor of the wonderful work that Lubavitcher Shluchim do. May Hashem bless him and his family and may they much continued success מתוך שמחה וטוב לבב עבג"צ בב"א. This may be one of the reasons why Facebook was created. 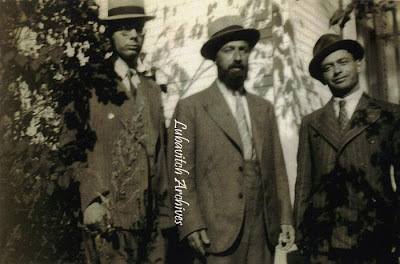 Our good friend Dovid Zaklikowski has created a beautiful Facebook page/group where he features many never-before-seen pictures of happenings in the Lubavitcher הויף and other happenings within .כרם חב"ד These pictures are usually without captions, save for sometimes giving a general caption or idea that tells you the general date or time or place of the event. Visitors are then asked to identify the individuals in the pictures. 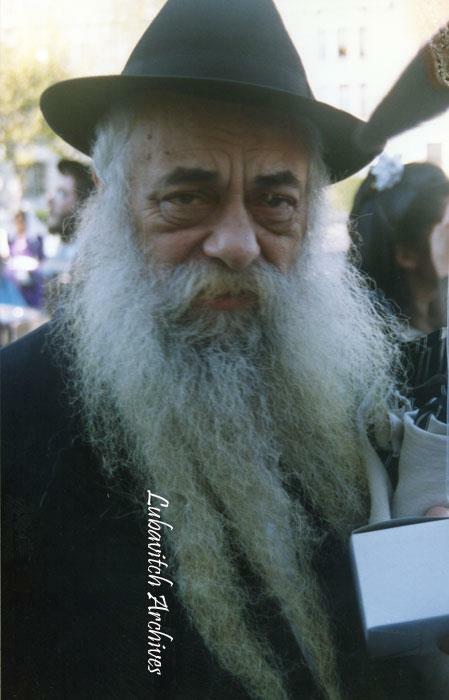 Take for example this picture here, of the revered Chossid Reb Shmiel Duvid Raichik ע"ה of California; where else would you see such a picture? Nowhere. And where else would you have such a Chossid? only in Lubavitch. Elsewhere he'd be a Rebbe already. 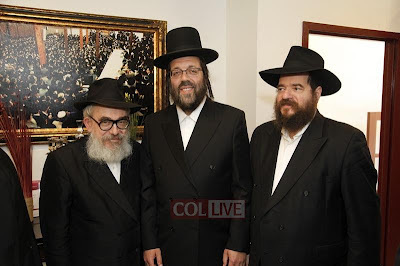 l-r: Rav Shlomo Wolbe, Rav Yakov Yisroel הי"ד, Rav Mordechai Schulman of Slabodka. 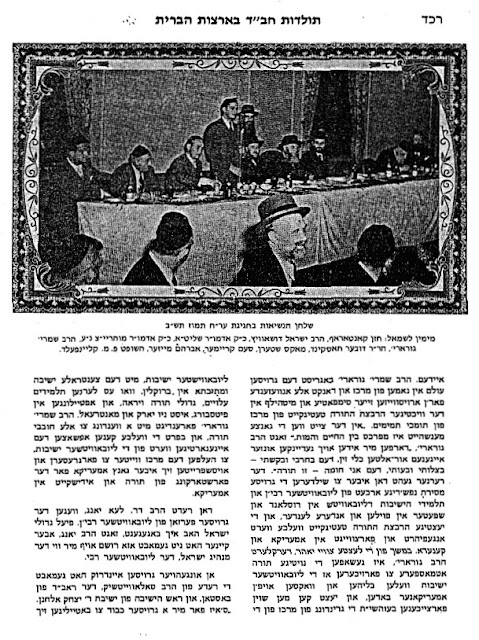 איי, וועט איר דאך פרעגן, what's the Lubavitch angle in this picture? Are we now claiming Rav Wolbe, or perhaps the Slabodka Bnei Beraq Rosh Yeshiva as one of our own? 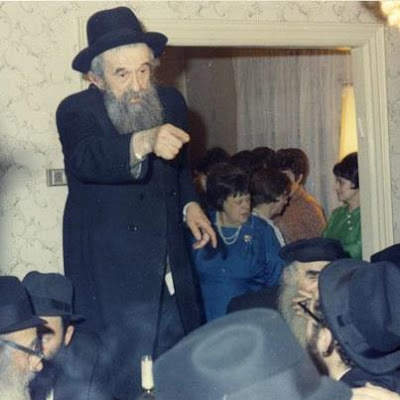 No, silly, it's Rav Zuber that made this picture appear in the archives. He was a Lubavitcher Chossid. The picture is apparently from the time that RYYZ was Rov in Stockholm, or maybe not. Rav Wolbe was from Sweden, but we don't know if RMS was ever in Sweden. So maybe it's from a time that RYYZ traveled to Europe. There are pictures of him with Reb Lazer Yudel Finkel in the archive as well. He later immigrated to the United States and was killed by a drunk sheigetz around New Year's of 1953. See an interview with his daughter Mrs. Chana Sharfstein from Crown Heights in Mishpacha magazine. And here we have a wonderful picture of the Chossid Reb Bentche Shemtov at a family simcha. Those who know could tell you that at a certain point of the simcha/farbrengen Reb Bentche would get up and make himself heard. Here he was probably calling out some other chossid, telling him that he's a no-good bum, for one reason or another. That he wasn't mekusher to the Rebbe and is therefore not worthy of breathing the air on G-d's green earth. To his left was his brother-in-law, the unforgettable Reb Mendel Futerfas. They were married to 2 sisters. RBS was married to RMF's sister Esther Golda. 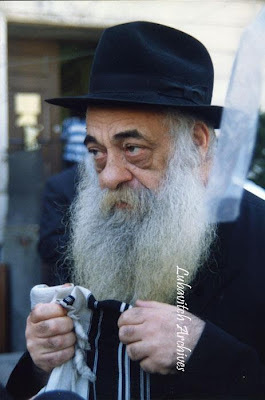 Reb Mendel is sitting with kabolas Ol, but you might say that he doesn't look very happy. Simches were a whole lot heimisher back then. You'd be shocked to see who liked PM Yitzchak Shamir and what he said about him! And we always believed that the Degel HaTorah people didn't like Mr. Shamir and favored Shimon Peres and his liberal stance on peace - and that "no land for peace" was an exclusively Lubavitcher opinion. But now, upon the passing of PM Yitzchak Shamir, we're hearing all kinds of nice things that were said about him by people that we thought were not on the same page politically with him. 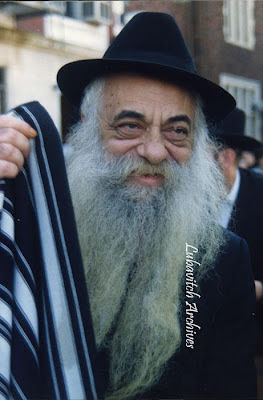 [From the Chabad sites you'd think that one of the ziknei haChassidim passed on, but that's become normal already, although nobody knows when and how that happened...] One of those people is the late Ponovizher Rosh Yeshiva, who was quoted by former Interior Minister Yitzchak Peretz as saying that he has ".דעת זקנים" Is it the Daas of זקני תלמידי חכמים or זקני עם הארץ? It seems to be a good thing from the article, judging from the fact that they say that he had הערכה towards him, meaning that it's a good thing. the Although there's no direct mention of his admiration of Shamir because of his stance on the peace negotiations in this article, there IS another one that makes mention of it and of the fact that the idea that the PR"Y was for giving land in return for peace is a MYTH. Here's that article. It happened once and lasted 21/2 years, from Feb.1949 to Aug.1951. And I don't believe it ever happened again. Agudah, Poalei Agudah, Mizrachi and HaPoel HaMizrachi. Anybody know why? Do you notice anything about the signatures? That's right, there are only Chasidishe Rebbes on it. Not a single non-Hasid. No Litvishe Rabbonim nor Rosheshives. Did Kol korehs work that way? separate but equal? Judging from the fact that The Agudah was not all Chassidish I would assume that the Litvishe Gedolim also supported this united front, so why did they not all sign together? And why did it never happen again? Who backed out? Who decided against it? 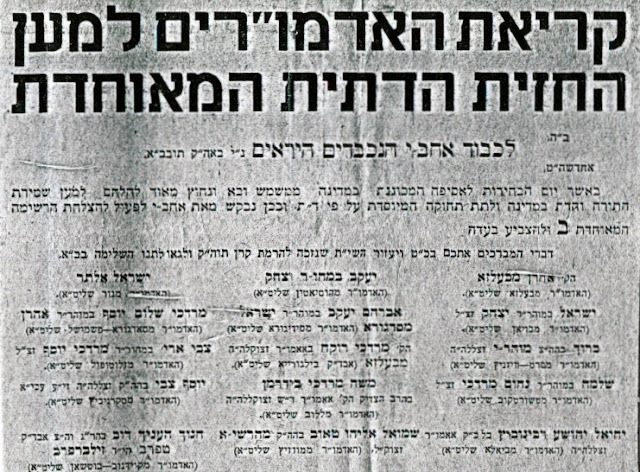 What were the Brisker Rov and Chazon Ish's opinions about the bloc? Were they for it before they were against it? I cannot recall at the moment and am having a hard time finding it in the history books. A bochur from a chasidisher broken family is in prison for over a week and he has nobody doing anything, but since he is a Yid we are going to help him by raising the funds to get him out of prison and provide him with supervised housing and psychiatric care. He was drunk and resisted arrest, a common symptom of drunkenness. We are getting him the proper help which would include supervised housing and ongoing psychiatric care. The bail is $12,000, $1,000, but the supervised housing and psychiatric care will cost more. Pidyon shvuyim is the greatest of mitzvos. Let us show our brother that we are always with him and we will do all we can to help him. Bail was reduced to $1,000, but we are also raising for ongoing supervised housing and psychiatric care. Please click on the paypal button below to donate.